The 30-year-old Democrat raised a ton of money and came close to 50 percent—but his near miss has few implications for the party nationwide. Missed it by that much. If Jon Ossoff, the documentary filmmaker running for Tom Price’s open seat in Georgia’s Sixth Congressional District, got a vote for every word written about him in the past few weeks, he could probably have been elected president—if only he were old enough to run. If the 30-year-old Democrat had just one vote for every $87 spent by his campaign—which raised $8.3 million for a seat where the last Democratic candidate spent only $346—he would now be on his way to Washington. Instead, Ossoff, who got 48.1 percent yesterday in the district’s “jungle primary”—pitting 18 candidates, regardless of party affiliation, into the same contest—now faces a runoff against former secretary of state Karen Handel on June 20. From the moment he launched his long-shot bid with an invitation to “Make Trump Furious,” Ossoff tapped a gusher of discontent that saw him endorsed by everyone from Representative John Lewis (whom Ossoff interned with in high school) and Georgia House minority leader Stacey Abrams to celebrities Debra Messing and George Takei. Nancy Pelosi hosted a fund-raiser for him at DNC headquarters. Actor Samuel L. Jackson cut a radio ad which, though not mentioning Ossoff by name, urged listeners “to channel the great vengeance and furious anger we have for this administration into votes at the ballot box.” Alyssa Milano and Christopher Gorham, in Georgia filming a pilot for CW, tweeted an offer to personally drive Ossoff voters to the polls. What’s not to like? Especially since Trump rose spectacularly to the bait, not only attacking Ossoff on Twitter but taping a fund-raising appeal to supporters warning “only you can stop the super liberal Democrats.” Though neither Handel nor any of the other 10 Republicans running in the primary spent anything like Ossoff, the GOP’s Congressional Leadership Fund super PAC put $2.2 million into ads attacking him, including one featuring the shocking revelation that as a student Ossoff once dressed up as Han Solo—and even sang in a Georgetown a capella group! Flipping the Sixth—a district that last “flipped” in 1978, when it sent a young professor named Newt Gingrich to Congress—would indeed represent a bloody nose for Republicans, who carried the seat by 23 points in November. Though not a catastrophe for Trump, who led Clinton here by less than two points—the gap between Trump’s performance and Price’s is the rationale for Ossoff’s candidacy—a loss here would also be an embarrassment for the president. And who could possibly object to that? Of course Ossoff could still win the runoff—though Nate Silver’s claim “the outcome of a runoff is more like a true 50-50 proposition” shows that not even quants are immune from wishful thinking. Winning a two-person race in a historically Republican district, gerrymandered to stay that way by some of the cleverest minds in politics, against an opponent with both name recognition and statewide experience, would be a huge upset. But even if Ossoff does pull one off in June, it will be hard to paint his victory as any kind of progressive triumph. The candidate himself seems earnest, and (to borrow a phrase) likable enough for someone who has clearly had his eye on a political career for quite a while. As a filmmaker, Ossoff’s targets have included “Nigeria’s Fake Doctors,” Big Tobacco (in Kenya), and corruption in Mozambique—all worthy, and all very far away. As a candidate, he’s been forthright in defense of Planned Parenthood—which might actually help against Handel, who resigned from the Susan G. Komen foundation after the group reversed a decision to cut funding to Planned Parenthood. And he’s nobody’s idea of a blue dog. But with campaign ads arguing “both parties in Washington waste too much of your money,” Ossoff is running as a pragmatic centrist, not a political revolutionary. That doesn’t bother MoveOn.org, whose 15,000 Georgia members voted overwhelmingly to endorse him. “He’s talking in a way that connects with voters in his district,” Matt Blizek, the group’s electoral field director, told me. “This was a pretty pro-Clinton district,” he said. Ossoff, for better and worse, is definitely a candidate a Clinton supporter could love. 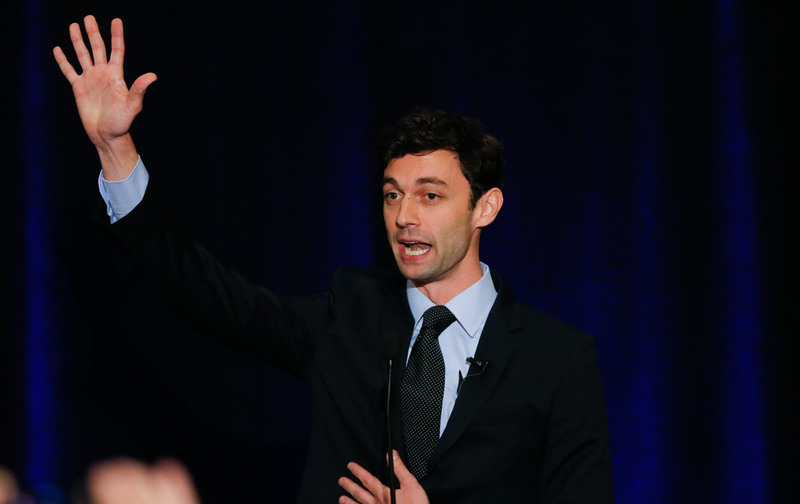 Just as an Ossoff victory would represent a repudiation of Trump, but not our broken politics, his failure to pull off an upset yesterday has little to tell us about the prospects for bolder candidates with more audacious agendas. A winning smile and the ability to avoid controversy will never be enough to turn this country around. Cutting off the school-to-prison pipeline, breaking the corporate stranglehold on our politics and Big Oil’s steady suffocation of our planet, ending the rationing of health care and educational opportunity by income and the police targeting of young men by race—all require a lot more than tinkering around the edges. There are Democrats, right now, who could lead those fights, like Rob Quist in Montana, Tom Perriello in Virginia, and Heath Mello in Omaha, struggling to raise a fraction of the funds behind Ossoff. It may have been fun to watch, but despite all the money, and all the media attention, the battle for Georgia’s Sixth District, however entertaining, was never more than an expensive sideshow.